Did you ever watch Star Trek? Even if the answer is no you probably have heard about the process of beaming, a method of transportation where one gets teleported almost instantly from one point to another. However, transportation or teleportation is actually quite the euphemism. What actually happens, according to Star Trek anyways, is that you are deconstructed on a molecular level only to be reassembled in a different place, using different particles. So, being killed and reborn in another place is actually a more accurate description of the process. But wait, if I am reconstructed using different matter, will I even be the same person? The answer must be: Yes of course! As long as you are a material monist that is. A material monist is someone who believes that the only thing that exists, or at least exerts any kind of influence in our realm, is matter. Even our consciousness is nothing more than a byproduct of complex neurological interactions. So, if you copy a person, right down to his smallest parts (whatever they may be) one should get identical results, including the consciousness. The technology of beaming is, however, far from perfect. For example, at one point the main character of the original Series, Captain Kirk got split into two personalities, one having all of his aggressive qualities and the other being extremely gentle. Even complete duplications have occurred and this is where things get interesting. Let’s say we are on a starship and have just reached a new planet. Scanners reveal no lifeforms but massive structures that prove the existence of an advanced civilization. We beam down to investigate. Unbeknownst to us, however, the inhabitants are not gone, but were advanced enough to be able to hide from our scanners. They are not only advanced, however, but also extremely cautious and want to know more about us, before they would consider any kind of contact. So, naturally, they want to study us and thus divert the different people who beam down to the planet into different, white, empty, identical (down to the molecular level) rooms so that they can conduct psychological experiments on us. In fact, they go one step further and duplicate every member of the awayteam, making them rematerialize in two different, identical rooms, so that they can test how the same person reacts to different impulses. “Liar!” You might interrupt me rudely … “the rooms and the Yous…or Mes or whatever are spatially separated, so they are in fact not identical.” This is true of course but wouldn’t it be funny if that actually mattered (pun intended)? This would mean that who I was would depend on my geographic location and that would mean that beaming would in fact kill me, even though I am reconstructed perfectly, simply because I would not be where I used to be. Going on step further, walking through a room would likely kill me, or at least my current consciousness (a point to which we will get back to). 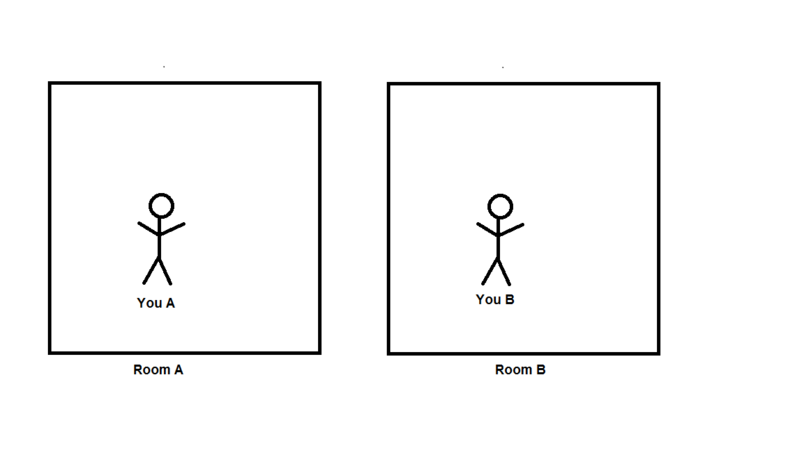 So, let’s accept for a moment that in all the important senses the Rooms and the Yous are identical. If this was so, then the solution would be simple: You are both Yous. And this is something I might actually accept but what would happen if the rooms became differentiated. A secret door opens in each room, revealing a corridor. One leading to the left (“Room A”) and the other leading to the right (“Room B”). Which one would you see? Let’s take a look at an example that isn’t quite as SciFi. There are people living in our world who are planning to one day transfer their consciousness into a computer to continue on their lives for as long as they want. Personally, I have always wondered how they think how this would work. I would die, you would press a button and BAM…I am back… or at least the version of me which I last saved. But if I turned the thing on during my lifetime I would not live twice, there simply would be another thing that acts like me. If I went to sleep and somebody turned on the computer I would not become the computer and I would not have magically gained all its experiences during my sleep and neither would it experience my dreams. I would be asleep, and it would possibly have a nice chat with a friend of mine. The same goes for my death. If I die and you turn on the Computer I would still be dead. You will have somebody to interact with who behaves just like me and it may even have its own consciousness but it will not have mine. I will be dead. So in summary, for everyone whose goal is self-preservation I do not think that I can recommend this method. I presume you know where I am going with this. If we accept that we are merely biological beings with a consciousness that stems from our biology these scenarios would be extremely difficult to explain. I cannot possibly be both of the people who were beamed down and I cannot be both the computer and me. So, the only solution is that there is something beyond the material that makes us, well…us and so I am happy to announce that I have proven once and for all that each and every one of you has a soul – an immaterial thing that is truly unique (cannot be copied) and is responsible for your consciousness – or at least I would be if there wasn’t one major flaw to my line of reasoning. During this argument I have simply presupposed that personal consistency is a thing. Although our bodies change over the years and so do our thoughts and emotions, we still remain the same person to some extent. There is a nice little saying: I have had this hammer for 17 years. I replaced the head twice and the shaft five times. But is it really the same hammer? And if we think back to the time when we were 5 years old, were we really the same person as we are today? Did we even have the same consciousness? Are those not merely memories of someone else that happened to live in our heads at the time? Let’s say that our consciousness is nothing more than a byproduct of neuronal activity. This means that a very specific brain state creates a very specific corresponding consciousness but only for that moment. If I had just created you from scratch, with all of your brain architecture in place, with all the neurons firing just like they are now, then you would believe that you have lived a life, your life to be specific, up to this point even though in fact you weren’t here a few seconds ago. We (as in our consciousness) exist only in the very moment that our neurons fire in that very specific way. After that we are gone just to be replaced in an instant by a new consciousness. If this were true, we would in fact die multiple times every second. That being said there is of course some consistency. Our biology follows certain rules and so there is a reason why a certain neuronal state follows another. So, every new incarnation of us will continue the actions (or even thoughts) of the former one without even noticing that something is wrong. The good news is that I can safely beam down from my starship. It doesn’t even matter if I get split in two. I will be dead but I would be just as much if I had stayed on board. I die every moment no matter what I do, just to be replaced by an “imposter”, who even has the nerve to truly believe that he is me. And so, if our Usses would meet on that planet, they both would be convinced to be the real deal and they would be right and very much wrong at the same time. So death is nothing to be afraid of, as we are already experiencing it constantly. Our biology just doesn’t notice. During the time it took me to write this article I have been reincarnated countless numbers of times as have you, while reading it. A whole number of Yous have spent their entire existence looking at a few letters a dead man typed. I have to admit… I find this idea rather depressing so I think I will just decide to believe in a soul. And if I am wrong I will not have to live with my mistake for too long anyways. Edit: as I was asked a couple of times… I like the idea of the soul being some kind of alien lifeform, which is attracted to material constructs of certain complexities and latches onto them. They interact with their host, while leeching their experiences, forming a symbiotic (or maybe parasitic) relationship. Of course, this does not say anything about their lifespan or about how much of one host remains with the soul but it would at least be an interesting option.